As I type this, I am installing Windows Vista Beta 2 on my PC, via my web browser, onto a virtual machine under Microsoft Virtual Server 2005 (MSVS)… Everthing seems to be going smoothly and much better and simpler than VMWare. I am, so far, very impressed with what Microsoft has done with this software. The main thing that I think is innovative is a web browser based interface to MSVS (Make sure you have IIS installed on your PC before installing it). It creates a virtual directory off your webroot that you can log into, create and control the machines. (see screenshot). 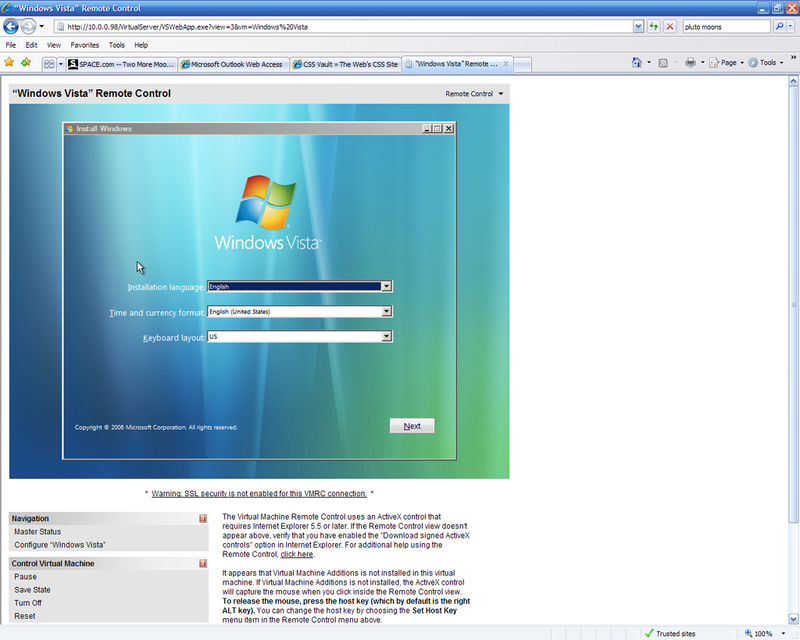 The web interface utilizes an ActiveX control to display the Virtual Machine’s screen. So you will need need to use IE to access it. Once in the admin interface, you can click a button and display thumbnails of all running OSes, select one and it full screens it in interactive mode. Microsoft Virtual Server 2005 runs primarily on the Windows 2003 Server line, but I am using it on Windows XP Professional SP2 (for “non-production use only”, Microsoft says). This is just a brief introduction to this software, but I will continue to test the capabilties to install other versions of windows, Linux, and I may even try Mac OSX since it is x86 based now. On the Microsoft Virtual Server 2005 website, it states Mac OSX will not run, but that was probably written when OSX was PPC only.